Fujan stem ginger soaked in Teacher's scotch whisky. 5% ABV. 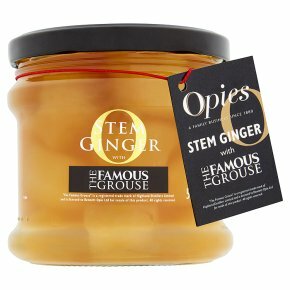 Grown in the foothills of southern China, this young ginger root plant is renowned for its delicious, strong and distinctive taste. Serving Suggestions: Hand bottled, and carefully preserved in a light syrup made with Teachers Scotch Whisky they are delightful on their own or served with ice cream, yoghurt or fresh cream.